The Shanklin & Sandown Golf Club was opened for play as a nine hole course in 1900. Work had been started many months before this as the land was a mass of high gorse, which had to be cleared before any question of siting fairways, green and tees could be considered, with the exception of what is now the 18thhole, there was no open space. Dr John Cowper, of Shanklin, was the original inspector of the project. His knowledge of the countryside had enabled him to recognise this was a suitable piece of country of which to make a golf course. An approach had been made to Mr White Popham, the Lord of the Manor, as early as 1896, but, owing to the illness and subsequent death of Mr White Popham, another start had to be made in 1899. In this year a petition, signed by some five hundred residents of the district, was presented to Mrs White Popham, asking that the original project might be carried out, as it was considered that a golf course would be such a benefit to the neighbourhood. This request being granted, various local well wishers subscribed £1,000, a considerable sum at that time. Dr Cowper, ably assisted by Mr Reginald Fox, of Shanklin, Colonel Arthur Atherley of Landguard Manor, and many local pundits, formed a Committee to start work on the proposed course. Eighteen men were put permanently to work clearing the ground. There was no mechanical equipment in those days and all the work was carried out with pick, shovel and axe. Labourers at this time received about 18/- per week at the most. With the building of a small clubhouse, stabling and outhouses, the £1,000 did not last long, and it was found necessary to issue more than one lot of Debentures. These were not finally paid off or surrendered until 1925. Princess Beatrice, then the Governor of the Island, was pleased to accept the position of Patron. Lord Alverstone, the Lord Chief Justice of England at that period, and a large landowner in the district, was the first President. John Hogg was the first Professional. Tom Dunn (of the famous Scots family), who was based at Bournemouth, was employed to design the course. Unfortunately, after completing only 9 holes, he died in 1901. 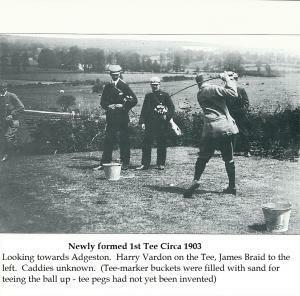 James Braid, many times Open Champion, was then called in as an architect and alterations and improvements were continually made until 18 holes were eventually completed in 1903. The 18 holes, as then played, were interesting and sporting, in spite of one or two ‘freak’ holes, but the real drawback was the danger from the amount of ‘crossing’ of the holes. The first eight holes were played straight at each other, the 8th being as at present, the 1st being played from the back or side of the 18thgreen on to the top of the hill, locally known as Majuba Hill. This being the highest part of the course, had no less than four greens on it and was played at from all points of the compass. The 10thhole was another dangerous one near the green. This hole was 600 yards long (a par 6) and was played from a tee in front of the Professional’s shop to a location about where the second green is now sited. These conditions continued up to the 1914-1918 War. The membership of the Club during that period was reserved for service, professional and independent gentry. There were many visitors to the Club, families having summer residences in the district and bringing guests for long summer holidays. Some twenty men and youths were employed as full time caddies and made a fair living from this source. With the First World War, much of what was left of these days of affluence disappeared. There was a large membership in those days and Sandown and Shanklin were residential towns of the best order. The influence of the Victorian era had not altogether disappeared. The Green Fee was only 2/6d. per day and when as much as £1,200 was taken in one season, the numbers of visitors were many. Eight men were employed on the course and six women and a boy in the Clubhouse. This was before the motor car and players spent the whole day at the Club, returning home either by the carriage and pair or the local railway at the end of the day. There were as many as eighty to tea on some days and, on one occasion, a hundred to lunch. This was beginning to tax the size of the Clubhouse and the capacity of the kitchen, and consideration was being given to the enlargement of the premises. Then the motor car became the normal method of transport and the effect on the Island, although gradual, became increasingly evident. There was then difficulty in bringing a car on to the Island, and the corresponding case in visiting other parts of the country, had a very disastrous effect. The ‘red light’ was up as far as the residential district was concerned. Eventually, after long discussions with the local authorities, it was possible to build a road to enable cars to reach the Clubhouse. In 1923 it was decided that more land must be purchased and three new holes were made – the 14th, 15thand 16th. Alterations were made to the remaining holes and much of the dangerous crossing eliminated. There are not many left that remember the old course, but some looked back regretfully to the former 18 holes they had so long enjoyed. In the period up to the Second World War 1939/1945, the Club enjoyed various periods of prosperity. One highlight was the annual match against the Officers of the Royal Yacht and Flag Ship during Cowes Week Regatta. King George VI, then the Duke of York, played regularly in these matches. But the ‘winds of change’ were afoot. It was no longer an economical proposition to run the Club for the few and the basis of Membership was broadened to take in the local businessmen who, up to now, had not obtained Membership. The Club was again well set and making headway when the Second World War was upon us. During the war the Island was a prohibited area. There were no visitors and the majority of the Members were away. The Club was kept alive by a faithful few, Captain S T Ricketts, the Secretary, Fred Shilling, Dr Charles Fernie and Mr Percy Lacey. The Professional played a considerable part in keeping the Club and course together so that another start could be made after the war ended. The war ended but golf was not the popular game it is today, and it was difficult to balance the budget year by year. In 1950, the Club’s Golden Jubilee year, there were 208 Members and the Club was several hundred pounds in the ‘red’ to the Bank. Some consideration was given to approach the local Council to take over the course and make it into a Municipal course. It was then decided that a special effort must be made. The Artisan section was absorbed into the Parent Club and there was a great drive to increase the Membership. Visitors began to come again in fair numbers and the course was beginning to recover from the effects of the war years. By the time of the Club’s Diamond Jubilee year 1960 much progress had been made. The Membership had more than doubled and the visitors were increasing annually. In recent years the Committee have been able to purchase from the Shanklin Estates, Black Pan and Lake Commons, so that the whole of the course is now the property of the Club. The bank overdraft required for this has been cleared and considerable sums spent on modern machinery for the course and improvements to the Clubhouse. The popularity of the game has never been higher. The excellent programmes of golf on television have brought the game to the interest of thousands of people who are anxious to take up the game. The present Membership in all groups is 647 with a strong entry of ‘Colts’ and Junior Members. These will, in due course, produce some fine players. Many improvements on the course and in the Clubhouse are underway. In 1948 it was said that there would be no more golf courses made throughout the country. So popular has the game become that, in spite of the high cost of land, many new courses have been, and are being, made. Especially near the big towns there are not sufficient courses for the newcomers and many Clubs have waiting lists for Members. Entrance fees of £40 to £50, with subscriptions at a similar rate, are becoming the general rule. The Club is on the rota for the Hampshire, Isle of Wight and Channel Islands County Championship and the Ladies’ County Championship. The Isle of Wight Golf Union Amateur Championship is held annually at Shanklin & Sandown. During the Golden Jubilee year an exhibition match was played by Alf Padgham and Sam King. Many well known Professionals and Amateurs have visited the Club and enjoyed the course – James Braid, Harry Vardon and, in recent years, J Jurado, the Argentine Champion, Bobby Lock, Peter Alliss and others. During the 1920’s an exhibition match was played by Abe Mitchell and George Duncan. In 1946, Ian Patey, a Member of the Club, brought honour to us by winning the English Amateur Championship. Patey was the ‘runner-up’ for the same Championship in 1950. When preparations were underway in 1899 for the formation of the Club and the preparation of the course, Tom Jocey was appointed Secretary pro-tem. He was followed by the first Club Secretary H H Peacock (1900). Then came Charles Hunt (1908), H R Parker (1912), P O Francis (1916-1919), Captain Seymour T Ricketts (1919-1950) and C G Dinham (1950-1975). John Hogg (1900), followed by Charles Harris (1906). Harris lost his life in the First World War. After this Fred Shilling, who had been Harris’s Assistant, and Percy Lockyer were appointed Joint Professionals to the Club. 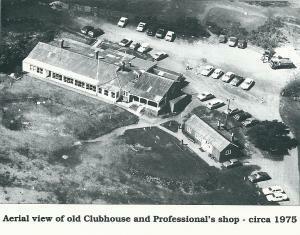 This arrangement continued until Percy Lockyear was appointed the first Professional to the Liphook Golf Club in 1922. Fred Shilling continued as Club Professional until his retirement in 1956. Herbert Matthews followed but, unfortunately, ill health forced him to retire after a short period. 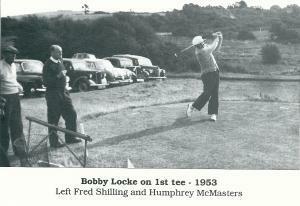 Roger Matthews was appointed in 1957 and continued to be our popular Professional until his retirement in 1988. He was followed, for a relatively short period, by Paul Warner who left in 1990, and our current Professional, Peter Hammond, took over in June 1990. For those of you who are interested, please find below a link to Brian Curd’s website, which shows a cine film which was taken prior to and during the Golden Jubilee Match in 1950 – Alf Padgham & Sam King vs Colin Haworth & Fred Shilling. Samuel Leonard King (27 March 1911 – 23 February 2003) was an English professional golfer, best known for playing on three Ryder Cup teams, 1937, 1947, and 1949 Ryder Cup teams, including scoring his team’s only point in 1947. Please also see attachment, showing plans of the course over the years.